Discover the exclusive Cash Back service offered by RIVIERA CHANGE MONACO, exchange office in Monaco. 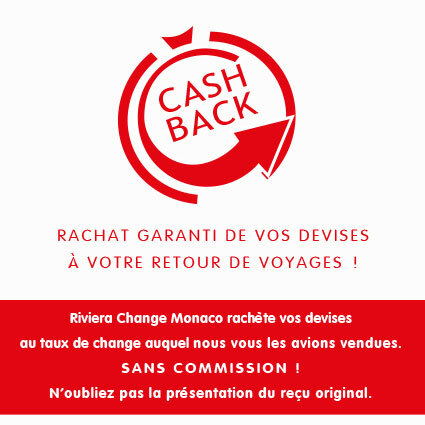 RIVIERA CHANGE MONACO offers to buy back your euros at the same exchange rate at which we sold them to you! The buy back of your foreign currency guaranteed after your return from your trip! It is always difficult to anticipate the sum of money that will be spent during a trip abroad. Riviera Change offers to buy back the foreign currency at the exchange rate at which you have bought it from our company, upon you return from your travels! In such a way you will be guaranteed against exchange rate fluctuations. You will be able to buy larger amount covering all your needs on your destination place, free from fear of losing money after your return. Upon your return, we will buy back the remaining foreign currency on the guaranteed conditions on presentation of the original receipts and a valid ID document.